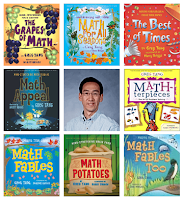 I hope you'll also visit my game site GregTangMath.com where you can play my online games, read my interactive books, and download my teaching materials. Can every child and adult learn to enjoy math? Yes, and my goal is to make sure they do! p.s. Watch for my new teaching videos on this site later this year. Shop & support our free site! © Creative Smarts Inc. Powered by Blogger.